... if any of you can guess the inspiration for Rose's birthday cake? I'll be back with more pictures soon... We had so much fun! Is the inspiration from the first snowfall of the year coming on her birthday? I am almost done uploading the rest of the pictures from her "Favorite Things: Sound of Music" birthday party!! I'm so excited to share them with you all. Rose's "cream colored pony" earlier gave it away... besides, like Rose, the Sound of Music was MY movie growing up... along with Mary Poppins. Hey - that would make an awesome birthday theme party, too, wouldn't it? I thought I had given enough hints! :) Mary Poppins... that would be fun! I'm struck by your beautiful design and work, though. You are getting to be SO stinkin' good at this! Really, most folks would pay good money for a cake like that I'm sure. Happiest birthday wishes to your sweet little girl. Okay, before I read all of the comments my first inkling was Sound of Music (really! )..but then I didn't get how the snowflakes fit in. But wow, this is AWESOME all around and now I will have that song in my head as I go to bed..and that is a GOOD thing!!! 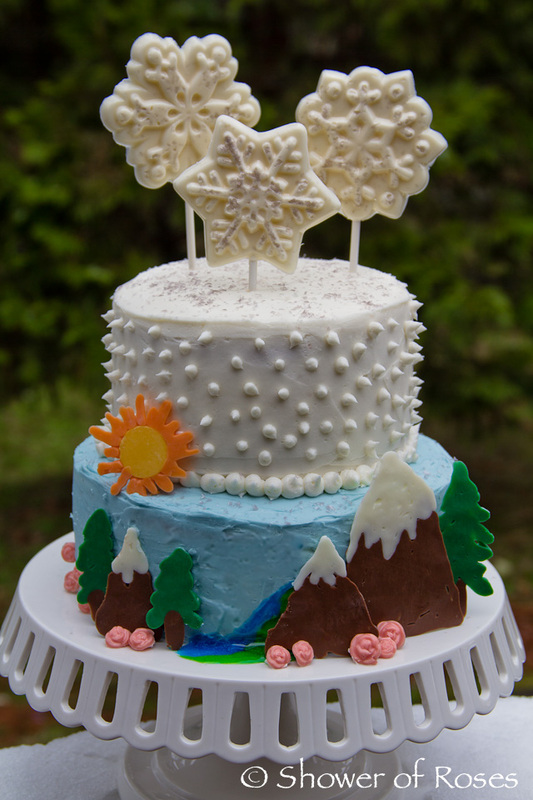 Are those snowflake candys from a Wilton mold? They are so beautiful!!! Well, I saw your other post so I know the answer but my first thought had been something to do with snow in the Alps, but it didn't make sense. And then The Sound of Music popped into my head, but that's as far as I got. The cake is so pretty. I am sure Rose just loved having her birthday.